At this point in the game, there is no need in predicting what the weather will hold for the 2018 planting season. For the past two years, cotton growers in NC have experienced challenging conditions and suboptimal weather during the planting season. Although we have no idea what this spring will hold for us just yet, it doesn’t hurt to revisit some of the lessons learned over the past couple of years in case we face those conditions again. Beginning in late April, we will be releasing the Planting Conditions Report, usually twice per week throughout most of the planting season. Dr. Edmisten does an excellent job with compiling heat unit data from weather forecasts for our state on a timely and meaningful basis for our growers. These reports are to be used as a guide throughout our cotton planting window to determine if and when to plant cotton, as well as a guide for possibly adjusting planting practices to minimize risks. These reports are based solely on predicted or forecasted heat unit accumulation for each period of time, therefore it is important to understand how these reports should be used. The points below explain a few of the fundamentals behind the Planting Conditions reports that growers should understand. The Planting Conditions reports are based on weather forecasts, and are only as accurate as those weather forecasts. We all know that weather can be unpredictable and erratic at times. This spring, so far, is a testament to this point. We’ve experienced warm weather at times that we expect it to be cold (February) and March was noticeably cooler than normal. Periods of short-lived warm weather have been abruptly interrupted by drastically cool/cold snaps. During the spring planting season, the same erratic behavior in weather can, and often does, continue. In addition to erratic weather, the weather forecasts can drastically change in a short period of time as well. There were several instances last spring where the weather forecast would drastically change within 24 hours following the release of a Planting Conditions report. We will continue to re-evaluate these drastic changes in weather forecasts as the spring progresses, but it is important to note that the reports are based on forecasts that we have on-hand at the time, and thus our advice can change from day to day if the forecast changes, and the reports are not intended to be used as a guide for a long period of time. In addition to our reports, it is important to monitor your local weather forecasts frequently and consistently throughout the planting season, in case drastic changes in the forecasts occur. Also, it is generally wise to monitor your local soil temperatures in the top 3 inches of soil. Ideally, when temperatures in this zone reach 65 degrees by 10:00 a.m. accompanied by favorable heat unit accumulation for the 5 days following planting, it is ideal to plant. If this is not possible, avoid planting when soil temperatures stay below 60 degrees for a prolonged period of time. The cooler (low 50s for example) and wetter the soil, as well as the longer period of time in which these conditions occur, the risks of poor stands increases. These reports are an assessment for risk. With any risk index, there are exceptions, both winners and losers. Last year especially, we heard from several growers that optimal stands were achieved when planting through less-than-ideal conditions whereas other growers noticed poor stands when planting though ideal conditions. Some of this phenomenon could theoretically be an exception to the rule, but in most cases last year, this effect was less of a product of planting temperatures but was more related to the timing intense and heavy rains which brings us to point #3. 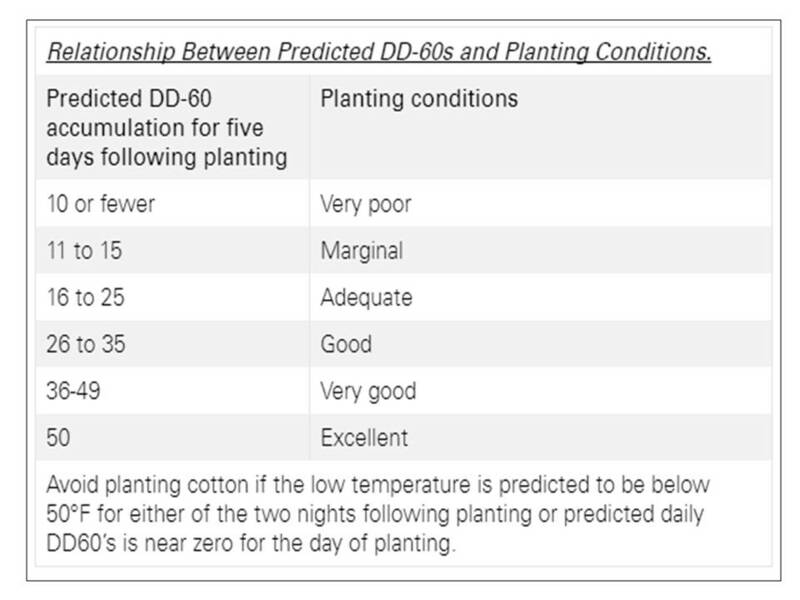 However, it is important to understand that the Planting Conditions report, and thus the advice for when to accelerate or restrain cotton planting, is based solely on predicted heat unit accumulation (see chart below) and from long-term research in NC. It is advised to avoid planting when predicted conditions are less than “good”, but growers can use special care when planting into “adequate” or “marginal” conditions (strategies discussed in the next article). Avoid planting altogether if conditions are “very poor”. 3. Rain amount and intensity are not considered in these reports. In many cases, the forecasts can be weakly predictable for temperatures, but much more so for rainfall. Sometimes, we may see a 30 percent chance of rain in the forecast for example, but we are not afforded any foresight as to how much rain will occur or if it will be a slow soaking rain, or an intense rain event. It is important to understand that heavy, intense rainfall can, and often will, negatively impact stand establishment even during periods of ideal temperatures. Successful planting and stand establishment can occasionally be achieved when planting through less-than-ideal conditions, especially if you adjust planting practices, AND avoid planting when intense rains occur soon thereafter. IF you have the luxury of seeing an intense rain in the forecast, it is best to wait until after the rain passes before resuming planting, regardless of predicted heat unit accumulation. Assuming an acceptable stand can be achieved, the optimal time to plant cotton depends on weather that occurs throughout the remainder of season. The timing of rainfall during the summer months relative to cotton growth stage can clearly reward or favor cotton planted in different time frames versus others. However, during planting season, it is essentially impossible to predict when rain or dry spells will occur during the summer months, or predict whether early or later planted cotton will be rewarded by properly timed summer rains. Yes, in some cases (definitely not all) high yields have been achieved in later planted cotton during the past few years, but that was most likely influenced by tropical storms in the fall. In the absence of a tropical event in the fall, earlier planted cotton would’ve likely yielded as high or higher than later planted cotton. The same effect would also be observed had a tropical storm occurred later in the fall, assuming some earlier planted cotton could be harvested by then. Our insurance cutoff (May 25th) and late planting period (May 26-31st) match very well to long-term research in NC, where the risks of lower yields increases when cotton is planted beyond these dates (see Table 4.1 from the NC Cotton Information book below). 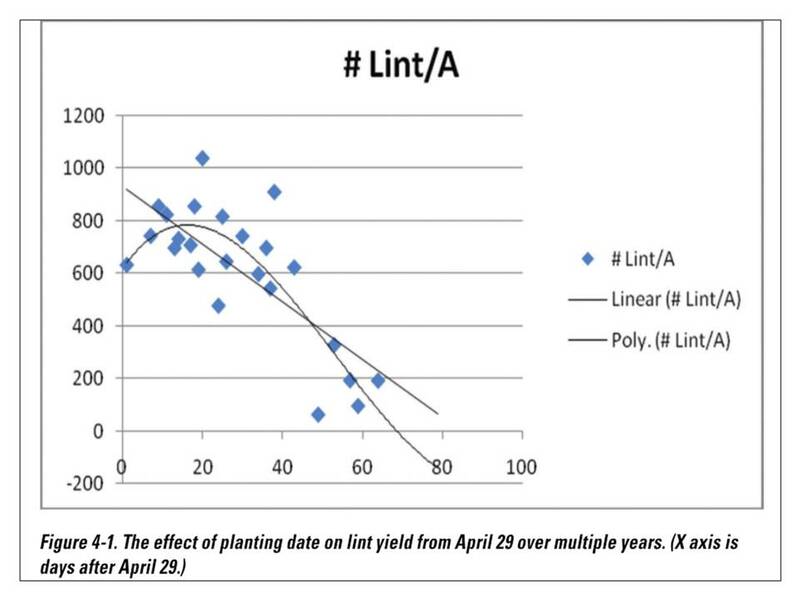 Therefore, anytime during our recommended planting window (late April – May 25th) is ideal for planting cotton as long as acceptable stands, rapid emergence, and good seedling vigor can be achieved, which brings us to point #2. 2. The “best” time to plant cotton during our recommended planting window is whenever you encounter ideal planting conditions. The first goal is to achieve an optimal, or at least an acceptable stand. Also, for many reasons (herbicide injury, thrips, seedling disease), it pays to plant when you can not only achieve and adequate stand, but also when early-season vigor is maximized (warm conditions with sufficient, but not excessive, soil moisture). When possible, avoid planting when all of the aforementioned can not be achieved. In many years, we don’t have the luxury of waiting indefinitely for good conditions to arrive. The next article will address how we can adjust planting practices to achieve the best outcome if we are forced to plant in less-than-ideal conditions.